In earlier articles (farmdoc daily April 28, 2016; October 7, 2016), we projected earnings for a case farm in west central Indiana, and examined the sensitivity of earnings and the farm safety net to changes in price and yield. This article updates those estimates for 2018 using base corn and soybean prices of $3.80 and $9.25, respectively. Under these crop prices and trend yields, projected earnings for a corn/soybean rotation are -$84 per acre. For the base price and trend yield scenario, ARC-CO and crop insurance indemnity payments were very small. The sensitivity of projections in ARC-CO and crop insurance indemnity payments and earnings per acre to alternative price and yield scenarios is examined in this article. The public sector safety net that is now in place to buffer crop farmers from the economic downturns has two dominant components (not including disaster assistance and other programs such as low interest emergency loans) – payments received under the farm program (ARC-CO, ARC-I, or PLC), and subsidized crop insurance. The majority of Midwest corn and soybean farmers chose the Agricultural Revenue Coverage – County Option (ARC-CO) farm program option which in essence provides a payment per base acre of corn and soybeans that depends on the level of yields and prices. The crop insurance program provides an indemnity payment to farmers if prices and/or yields decline, depending on the program and coverage level chosen. The most common program choice is revenue protection (RP) which buffers gross revenue from price and/or yield reductions – coverage level choices range from 50 to 85 percent of market revenue. When the crop insurance and farm programs were initiated, it was anticipated that they would provide an effective safety net for farmers who might encounter significant price and/or yield reductions due to changing market conditions or weather/disease events. But crop insurance indemnities adjust to market conditions over time. If prices systematically decline, revenue guarantees and potential indemnity payments also decline. Farm program payments under the ARC-CO program are capped, and they decline as market prices increase. So in contrast to the most recent direct payment program that resulted in a pre-specified amount of income and cash irrespective of market prices, under the current program higher prices may result in more income from the market and less from the government in many circumstances (a “dead zone”). Also, it is important to note that cash payments from the ARC-CO program are not received until approximately a year after the crop is harvested, so they are not available to meet cash flow requirements in the year of actual production. Given these characteristics of the safety net, how effective will it be in buffering the financial stress that crop farmers are facing in light of the recent declines in corn and soybean prices? The numerical analyses below provide insight into the answer to that question. Average projected gross revenue and earnings for the 2018 are presented in table 1 for an Indiana case farm in west central Indiana (White County). Trend yields for corn and soybeans were used to project 2018 yields. The sensitivity analysis discussed below relaxed these yield assumptions. The July 2018 mid-point prices for corn and soybeans from the most recent WASDE report were used to project crop revenue and ARC-CO payments. Mid-point prices were $3.80 for corn and $9.25 for soybeans. Mid-July futures prices were used to project revenue protection harvest prices and crop insurance indemnity payments. Futures prices for soybeans are currently well below the mid-point price projection. The case farm was assumed to be enrolled in the revenue protection crop insurance program and to have chosen the 85 percent coverage level. The low price scenario and the high price scenario in table 1 assumed that corn (soybean) price was $0.30 ($0.75) lower and higher, respectively, than the base price. Purdue crop budgets and cash rent estimates were used to estimate crop production costs. Cash and opportunity costs were included in the cost estimates. Crop insurance indemnity payments and ARC-CO program payments in table 1 were computed using the price and yield estimates described above. The crop revenue, crop insurance indemnity payment, ARC-CO payment, gross revenue, total cost, and earnings per acre figures presented in table 1 assume a corn/soybean rotation. Crop insurance indemnity payments would be received for soybeans under the low and base price scenarios. With trend yield, crop insurance indemnity payments for soybeans would start at an approximate price of $8.65 and would increase as prices fall below $8.65. As shown in a recent article written by Schnitkey, Sherrick, and Coppess (farmdoc daily July 17, 2018), at above trend yields the harvest price would have to be relatively lower to trigger crop insurance indemnity payments. Under the price scenarios reported in table 1, the ARC-CO payments for 2018 are projected to be zero for both corn and soybeans. For this case farm, corn and soybean prices would have to fall below $3.25 and $8.30 for the farm to receive ARC-CO payments for the respective crops. 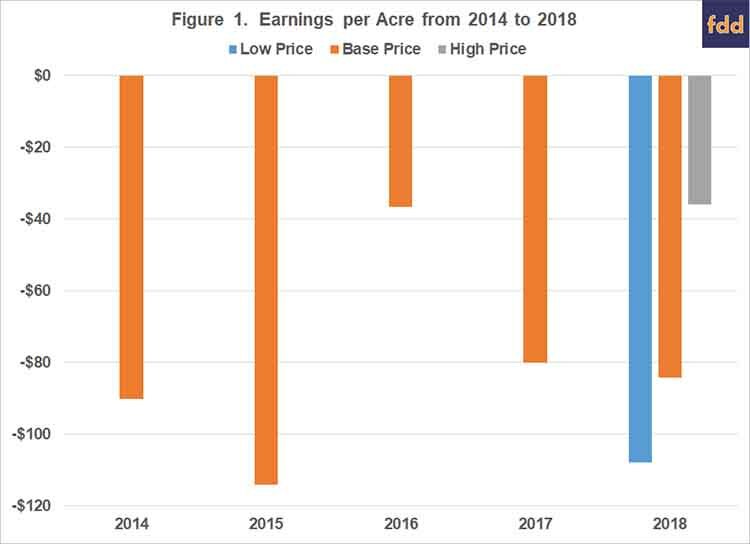 Figure 1 illustrates the earnings per acre for 2014-2017 and projections for 2018 for the case farm. Earnings per acre ranged from -$37 in 2016 to -$114 in 2015. Projections for 2018 range from -$108 per acre under the low price scenario to -$36 per acre under the high price scenario. Projected earnings for the base price scenario is -$84 per acre. It is important to note that the prices under the high price scenario are similar to projected prices in late May or before the imposition of tariffs. Table 2 examines the sensitivity of earnings and ARC-CO payments per acre for different price and yield scenarios for 2018. The corn and soybean yields in table 1 (i.e., trend yields) and the base price scenario in table 1 were used for the base yield and base price combination in table 2. It is also important to note that table 2 excludes crop insurance premiums and indemnity payments. Five yield and five price scenarios or 25 price/yield combinations are illustrated in table 2. The maximum possible ARC-CO payments for corn and soybeans in 2018 for this case farm are $55 and $43, respectively. None of the price and yield scenarios in table 2 exhibited maximum payments for corn or soybeans. The ARC-CO payments would be zero for the 15 percent and 20 percent yield scenarios at crop prices that are 20 percent lower than the base, and for all of the other price scenarios. Earnings per acre in table 2 range from -$156 per acre for the lowest price and yield combination to $193 per acre for the highest price and yield combination. To gauge the interaction between ARC-CO payments and market price increases in more detail, let’s examine the results in the first and second columns of table 2. 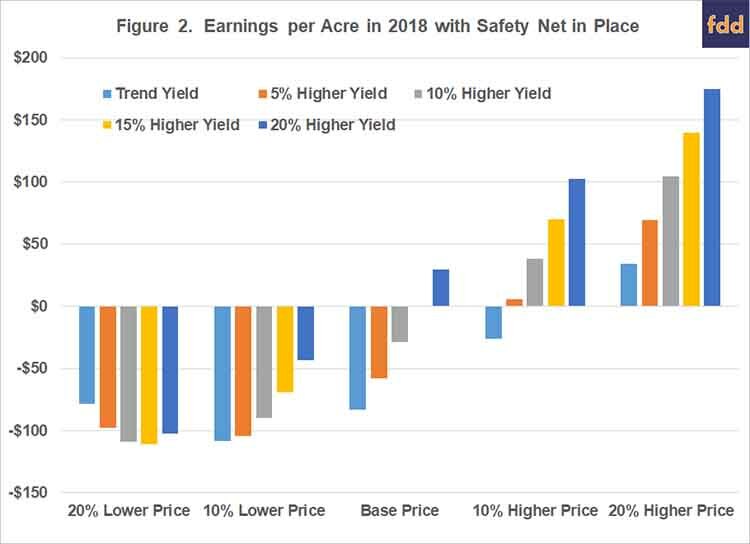 The difference in earnings per acre when prices increase from 20 percent lower to 10 percent lower than the base depends on the yield scenario examined. This difference in earnings (ARC-CO payments) averages $57 per acre ($10 per acre), and ranges from $26 per acre ($34 per acre) for the trend yield scenario to $73 per acre ($0 per acre) for the 20 percent higher yield scenario. To understand what is going on here it is important to remember that the ARC-CO payments depend on national prices and county yields. For some yield scenarios, the increase in gross revenue and margins resulting from a price increase is partially muted by a decline in the ARC-CO payments. As an example, for the trend yield scenario, the ARC-CO payment declines from $34 for the 20 percent lower price scenario to $0 per acre for the 10 percent lower price scenario. In essence, the improvement in gross revenue and earnings from higher prices is partially offset by reduction in government payments, so the effect on earnings is partially muted. 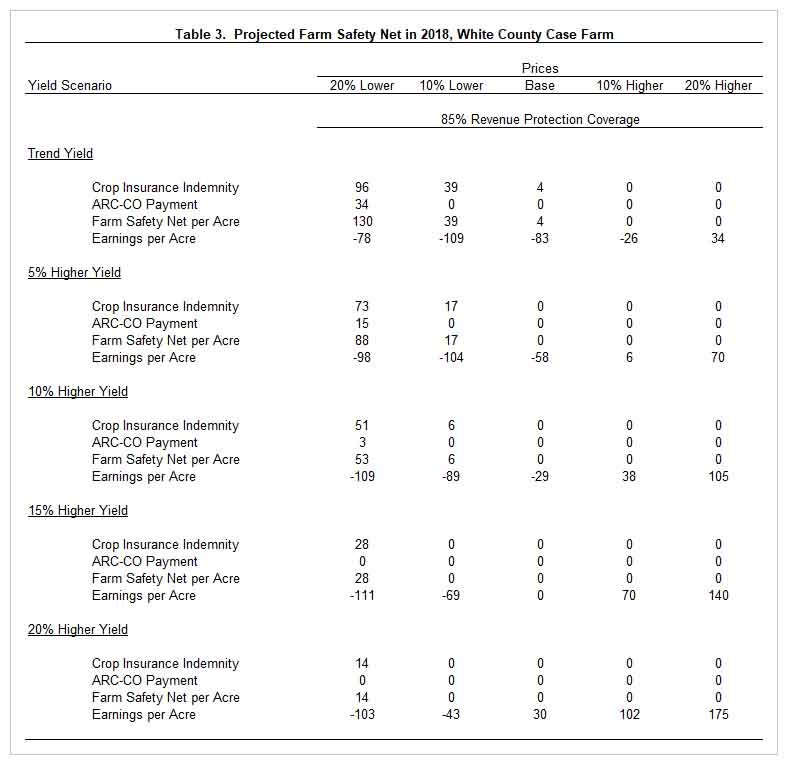 Table 3 examines the sensitivity of the farm safety net (ARC-CO program payments plus crop insurance indemnity payments) in 2018 to changes in price and yield. As in table 2, there are 25 price/yield combinations. An 85 percent revenue protection coverage level for crop insurance is used for the illustrations in table 3. The farm safety net per acre in table 3 is computed by adding the ARC-CO payment to the crop insurance indemnity payment. Crop insurance indemnity payments are above $50 per acre for the trend yield, 5 percent higher yield, and 10 percent higher yield combined with the 20 percent lower price scenario. Crop insurance indemnity payments are zero for the 10 percent lower price scenario and yields that are 15 or 20 percent above trend yields, for the base price scenario and yields that are 5 percent or higher than trend yield, and for both the 10 percent and 20 percent higher price and all yield scenarios. Earnings per acre for each combination are illustrated in figure 2. 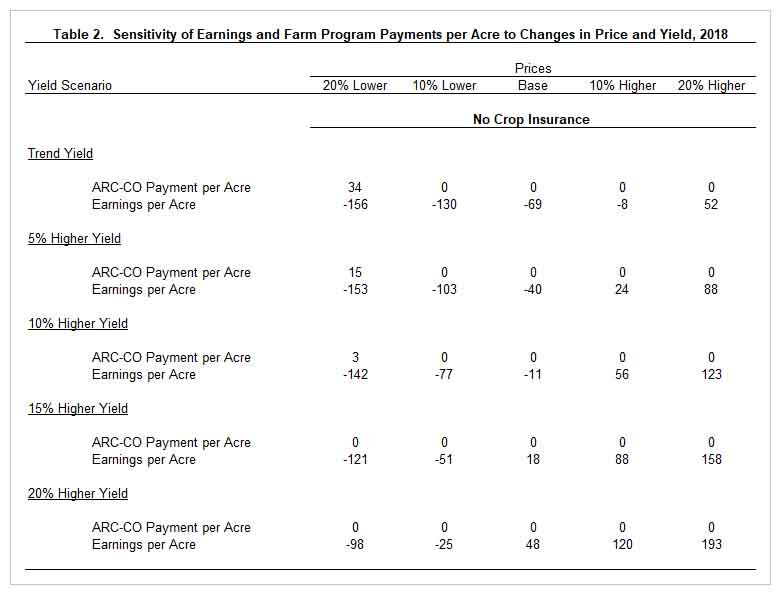 Though ARC-CO and crop insurance indemnity payments were very helpful for several combinations of prices and yields, earnings per acre are still below a negative $100 for 5 of the 25 price/yield combinations and below a negative $50 per acre for 11 of the 25 price/yield combinations in table 3. For the price/yield combinations for which a crop insurance indemnity payments were made, earnings per acre ranged from -$78 per acre to -$111 per acre. For these same combinations in table 2 (which excluded crop insurance premiums and indemnity payments), earnings per acre ranged from -$69 per acre to -$156 per acre. There were 10 price/yield combinations in table 3 with a positive projected earnings per acre. In essence, if crop prices and yields end up being relatively higher than the base prices and trend yields discussed in this article, earnings per acre would be positive. This article examined historical and 2018 projected earnings per acre for a case farm in west central Indiana. Annual earnings for the case farm were negative from 2014 to 2017. The results illustrated the gaping holes in the farm safety net in 2018. Given the drop in crop prices that has occurred since late May, expected earnings are expected to be relatively low again this year. Even with ARC-CO payments and crop insurance indemnity payments, 20 percent of the 2018 price/yield combinations examined had negative earnings that exceeded $100 per acre. Using base corn and soybean prices of $3.80 and $9.25 per bushel, projected earnings for a corn/soybean rotation was a loss of $84 per acre, which is approximately $50 per acre lower than estimates in late May. In summary, there are two issues related to the farm safety net we are currently facing. First, ARC-CO and crop insurance indemnity payments only offset a portion of the drop in earnings resulting from the large drop in crop prices that has occurred since late May. Second, the decline in the crop insurance revenue guarantee since 2012 has contributed to the large decline in the case farm’s ability to mitigate downside risk. Boehlje, M. and M. Langemeier. "The Farm Safety Net: The Good and Not So Good." farmdoc daily (6):81, Department of Agricultural and Consumer Economics, University of Illinois at Urbana-Champaign, April 28, 2016. Langemeier, M. and M. Boehlje. "An Update on the Farm Safety Net." farmdoc daily (6):190, Department of Agricultural and Consumer Economics, University of Illinois at Urbana-Champaign, October 7, 2016. Schnitkey, G., B. Sherrick and J. Coppess. "Will Soybean Crop Insurance Payments in 2018 Offset Low Prices?." farmdoc daily (8):131, Department of Agricultural and Consumer Economics, University of Illinois at Urbana-Champaign, July 17, 2018.